The Great Debates marked television's grand entrance into presidential politics. They afforded the first real opportunity for voters to see their candidates in competition, and the visual contrast was dramatic. In August, Nixon had seriously injured his knee and spent two weeks in the hospital. By the time of the first debate he was still twenty pounds underweight, his pallor still poor. He arrived at the debate in an ill-fitting shirt, and refused make-up to improve his color and lighten his perpetual "5:00 o'clock shadow." Kennedy, by contrast, had spent early September campaigning in California. He was tan and confident and well-rested. Kennedy's practice of looking at the camera when answering the questions -- and not at the journalists who asked them, as Nixon did -- made viewers see him as someone who was talking directly to them and who gave them straight answers. Kennedy's performance showed not only that he was a knowledgeable and credible elected official, but also that he just plain looked better. 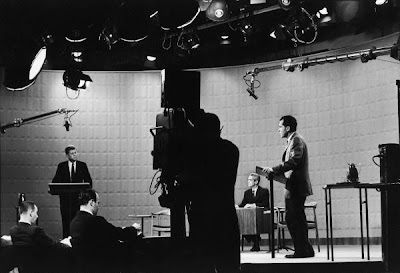 The televised Great Debates had a significant impact on voters in 1960, on national elections since, and, indeed, on our concerns for democracy itself. The debates ushered in an era in which television dominated the electoral process. John F. Kennedy had learned the power of the image, of the visual, from his father, who was for a time a power in the movie business. Joseph P. Kennedy was the first, or among the first, to merge the creation and marketing of the celebrity trade, the tricks of public relations, to the business of politics and governing. With politics aforethought, the founding father had created an archive—still and moving pictures of his children—ready to be used to entice a nation into a cause in the same way they were pulled into movie theaters. There was one thing President Kennedy always had time for: he would spend hours looking at photographs of himself and his family. That was neither narcissism nor pride to Jack Kennedy, but recognition of polities as a show of fleeting images. In the mostly black-and-white world of the early 1960s, the right picture in the right place duplicating itself forever was worth a great deal more than any thousand words. Audio/Visual show of the debate here.